Let’s get this out of the way up front: iMovie ’09 is the version Apple should have shipped when it decided a year and a half ago to start from scratch and build a new video editor for iLife. Instead, the company released iMovie ’08 ( ), a rough draft of what Apple believed a consumer video editor should be. 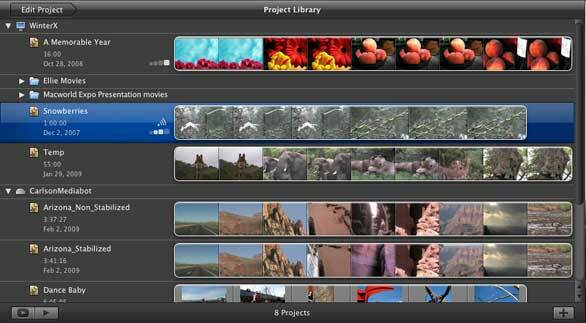 It offered several welcome feature improvements, especially for people new to video editing who were looking for an iPhoto-for-movies application. However, for users who were already familiar with previous versions of iMovie, those advances were easily overshadowed by its disparity from the mature iMovie HD 6 ( ). iMovie ’08 not only looked different—throwing away the traditional idea of a timeline running off the bottom of the screen, for instance—but it also lacked many features that had slowly filled out iMovie HD’s generous stable over the years. A few of those capabilities have returned. iMovie ’09 can now slow down or speed up clips; export directly to iDVD with support for chapter markers; easily extract audio from video clips for editing separately; and provide a way to make cutaway shots (formerly known as the awkward Paste Over at Playhead command). Themes have also reappeared, and are better implemented than in iMovie HD. Other features, alas, are still missing. Precise audio editing is still hampered by the inability to control volume levels within a clip. (You can chop the clip into lots of pieces and set the volume for each one, a technique we did away with when iMovie 3 came along; Apple believes this style of audio editing is too advanced for average users.) There’s no capability to write video back to tape in a MiniDV camera; tape is yesterday’s technology, so why support it? I’m guessing a significant number of people who own perfectly functional DV camcorders can offer reasons. And so far, third-party plug-in support remains a fond recollection of years past. iMovie ’09 didn’t just move mostly up to par with iMovie HD, however. Apple has crammed enough new features and thoughtful improvements into this version that you might think they’d rebuilt iMovie from scratch again. Following the iPhoto model, iMovie ’08 brought your entire video library under the same roof, even footage stored on external hard drives, making it easy to scan other events for footage without opening and poking through other projects. iMovie ’09 improves on this housekeeping by letting you choose where to store project files as well; they don’t need to all reside on your Mac’s internal disk. In the redesigned Project Library pane, you can relocate projects by dragging them to a different volume, at which point you’re given the option to move just the project file or the project and its associated source clips. The pane now provides a filmstrip representation of each project that can be skimmed, played back, or exported without actually opening it for editing. Another option is to view a full-screen preview of your projects with a Cover Flow browser for switching between projects. iMovie ’09 now supports saving projects, not just events, on external hard disks. Apple has also addressed one of the problems inherent in the emerging post-tape shooting world. When a tapeless camcorder fills up and you don’t have time to import the footage, or you want to make a backup of your master files, you can use the new archive feature to copy the raw video files to a hard disk or other volume. You can then import (and transcode) the archived footage at your leisure. One of the biggest surprises in home video has been the success of Pure Digital’s Flip camcorders ( ), minimal camcorders that offer no zoom and no built-in image stabilization to offset the camera shake that occurs when shooting handheld video. iMovie’s new image stabilization feature seems designed just for this market. iMovie ’09 can analyze footage either at import or on a clip-by-clip basis later, depending on how much time you want to be away from the computer. Because it’s looking at every frame, the analysis can take a while: for example, a slightly bumpy one-minute HD clip imported at the program’s Large (960 x 540) size took about four and a half minutes to analyze on my 2.33GHz MacBook Pro Core 2 Duo. The same clip at Full (1920 x 1080) size finished in about five and a half minutes. My results were mixed, but generally favorable. Don’t expect Steadicam results, especially if your footage is highly caffeinated. In those cases iMovie marks the clip with a wavy red line to indicate the shakiness is irreparable; a button at the bottom of the screen toggles whether such sections are visible or not. But for clips that suffer from a little motion, the feature works well. What I like about iMovie’s image stabilization is its implementation. Analyzed clips are not re-rendered, but rather iMovie keeps track of how much zoom and rotation is applied to every frame in order to minimize the amount of movement. That enables you to control how much shake is suppressed, using a slider on the new Inspector HUD. What some people might find disappointing, however, is that stabilized footage from modern cameras equipped with CMOS (complementary metal oxide semiconductor) sensors can sometimes display a wavy, heat-mirage appearance (due to the way the video is captured). Specifically, CMOS sensors use a rolling shutter that exposes different portions of the frame at different times. One area where iMovie ’08 fell down was in specific frame-by-frame editing. Although possible (by pressing Command-Option and dragging a clip’s handle in one-frame increments, a feature that remains in iMovie ’09), iMovie ’08’s interface made you wish you had a magnifying glass to better see what you were doing. The new version’s Precision Editor is that magnifying glass. When you choose Precision Editor from the new Action menu that appears on every clip, the Event Library disappears and the Precision Editor fills the entire bottom half of the screen. The controls, surprisingly, are not as intuitive as I would expect, particularly dragging audio offsets. But once you understand how the Precision Editor operates, it becomes easier. 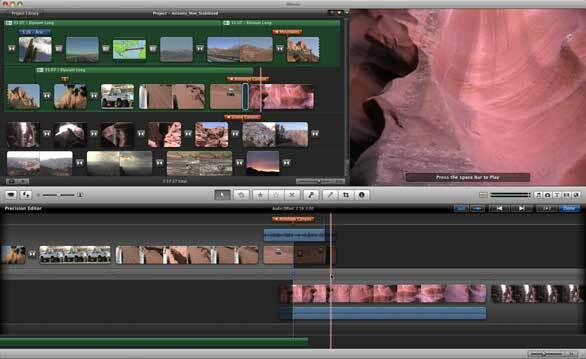 Other touches in iMovie improve and speed up the editing process. 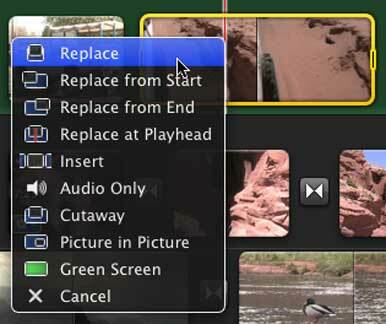 With the Advanced Tools option enabled in iMovie’s preferences, you can, for example, drag a clip from the Library onto a clip in your project and replace it outright, insert it at the playhead and break up the existing clip, and more. The Precision Editor lets you get in close to adjust the edit between two clips. Here I’ve extended the audio from the previous clip, at top, so that it plays over the image of the next clip, at bottom. The way iMovie ’09 handles video internally is mostly unchanged from the previous version: interlaced DV and HDV footage use single-field processing to improve performance, which means iMovie is throwing out every other horizontal line of information. Apple has deliberately made a tradeoff between performance and image quality for some footage. As noted in the iMovie ’08 review, if you need the best image quality, consider editing in Final Cut Express ( ) or Final Cut Pro ( ). According to Apple, the interlaced footage processing has been improved; however, the company is currently investigating numerous reports of interlace artifacts, particularly with 1080i footage. Other HD video (such as AVCHD) is converted to Apple Intermediate Codec (AIC) at 30p (30 frames per second, progressive) for NTSC or 25p for PAL. Although a few consumer cameras can now shoot at the cinematic 24p, such as Canon’s Vixia HV30 ( ), that frame rate is unsupported; iMovie will import it, but converts the footage to the NTSC or PAL default. Most people won’t notice any quality issues, and will appreciate the ability to make edits faster. In fact, while testing output from iMovie HD, I found myself wanting to apply iMovie ’09 features and commands: pressing the E key to add a clip to the project, for example, or grabbing footage from another project. And the rendering! It now feels ridiculous to wait—even for a few seconds—for titles and transitions to render after you’ve applied them. The number of new features in iMovie ’09 is satisfyingly overwhelming. In my testing I found that the following additions stood out among the rest, worked as advertised, and were easy to use. Green screen: For simple special effects, iMovie can knock out a green background and substitute other footage in its place. It only works with green, and doesn’t mask with the quality you’ll find in professional software, but it does a good job nonetheless. You can even adjust a “garbage matte” around the objects set against the green screen to help define which area to knock out. Maps and backgrounds: People must be making a lot of travel videos, or else the iMovie team maxed out their frequent flier miles last year and got inspired. iMovie offers four globe styles and four flat maps onto which you can project a moving line that zips from city to city. When you add a map, look up a starting city and destination in iMovie’s database; if you add another map, iMovie automatically takes the previous destination and makes it the starting point for easy multiple-point travelogues. Also available are a number of decorated backgrounds onto which you can add text, use as filler, or set as a backdrop for picture-in-picture or green screen scenes. Themes: Although only a handful of themes are available, they strike me as being more polished than those in iMovie HD. What makes them certainly better is the capability to change a theme and have all of its elements (title and finale, plus transitions and text styles) adopt the new theme without intervention on your part. Edit to music: In a new blank project, add a song as a background music track, and open it in the Clip Trimmer. Then play the song and hit the M key wherever you hear a beat (or where you want a visual edit to occur). When you add clips or photos to the project, their durations match up to the beat markers you applied. It’s a quick jump on building slideshows or music videos. Dragging a clip onto another clip provides several actions when iMovie’s advanced tools are enabled. iMovie ’09 restores the ability to set chapter markers and then export the project directly to iDVD, which is good news considering Apple’s disinterest in writing projects to disc. iDVD was barely touched in iLife ’09, moving from version 7.0.2 to 7.0.3 and losing the year designation in the program’s title. Although I’m thrilled that there’s now a direct route from iMovie to iDVD, I encountered one minor bug: the iDVD project doesn’t automatically assume the name of your iMovie project (everything is just “iMovie Project”), which Apple said will be fixed in an update. iDVD also exhibits a new odd behavior: your entire movie is loaded into iDVD’s Auto Play well, which means that a person playing the disc will see the movie before seeing the first menu screen. This action is deliberate, according to Apple, so that people who want to make a quick DVD without editing menus can have a disc that plays the movie right away. What’s more interesting is that for HD footage, iMovie sends the movie along to iDVD in Apple Intermediate Codec (AIC) format instead of the more-compressed H.264 encoded footage. That reduces a compression step on its way to disc, and results in a slightly higher quality DVD video. The hard truth—for some—is that iMovie HD 6 is effectively gone. Although it still works on today’s Macs, Apple stopped offering it as a free download for iMovie ’08 owners once iMovie ’09 began shipping. And eventually a Mac OS X update or something else will break it and that will be it. A year ago, with only iMovie ’08 as a consumer replacement, the transition away from the old iMovie was not an exciting prospect. iMovie ’09 has caught up with iMovie HD and surpassed it in features and performance (except in the areas of highest-quality HD, support for writing video to tape, and the lack of better audio editing tools). There are enough improvements in iMovie ’09 that I think it is no longer competing with iMovie HD, but instead with Final Cut Express, which is the next step up in Apple video editing. If iMovie is the most attractive player in the iLife suite for you, the improvements in iMovie ’09 make the purchase worthwhile.